Denmark’s concrete sawing and surface preparation industry is not big, to put it mildly. Compared, for example, to the neighboring Sweden, it is virtually nonexistent. 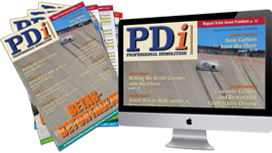 So every Danish company that has achieved an international standing automatically gets into PDi’s crosshairs. Despite the fierce competition from its Scandinavian and European rivals, Denmark-based V. Brøndum A/S has never been the one to bite the dust. Andrei Bushmarin reports from the company’s headquarters in Silkeborg. Denmark is probably the world's most environmentally conscious country. Denmark’s ecological standards are among the highest in Europe, and its citizens appear to have the notion of healthy living in their DNA. It is only natural that a major player in the dust control game should come from such a clean-cut place. V. Brøndum A/S was founded by Vagn Brøndum in 1964 as a family-owned trading company that imported industrial vacuum cleaners from Italy. There was a void in the domestic market for dust extraction equipment at the time, and V. Brøndum was very successful in filling it. The company continued evolving as a reseller until the mid-1980s when Denmark’s government tightened the dust control regulations. The existing machinery, and filters in particular, were no longer compliant and this precipitated a cardinal change in the company's development. In order to stay competitive, the company initially modified the machines it imported prior to becoming a full-scale manufacturer in its own right a few years later. Ronda is a brand name of V. Brøndum A/S’s most popular range of dust extraction equipment. In the past 20 years the range has grown to 23 models from the smallest Ronda 20 to the largest Ronda 2800H. The top of the range Ronda 2800H is a heavy-duty H class vacuum cleaner designed to process large volumes of fine cement and wood dust with the option to collect it either in a Longopac bag or a container. The machine is powered by three motors to provide the required suction. As with all the company’s vacuums the Ronda 2800H features the manufacturer’s trademark multi-tube filter technology ensuring 99.995% filtration. Thanks to these features, this model is suited for large-scale grinding and groove cutting jobs. Among other highlights of the range are the versatile mid-range vacuum Ronda 200H, which is currently the company’s bestselling model, and the pre-separator Ronda CF-501 unveiled earlier this year at BeBoSa. By 1995 V. Brøndum A/S had the domestic market under control, so to speak. Apart from Nilfisk that posed (and still does) a serious competition, there was no other player to challenge its supremacy on the home front. The time was right for international expansion, and located about 200km from the German border, the company had little doubt of its first point of attack. Thanks to its good reputation and to the fact that its vacuums were certified by SLG, the German institute for testing and certifying industrial products, it did not take long for business to take off. Currently V. Brøndum sells dust control equipment to its customers all over Germany through a network of 20 dealers. Accounting for some 57% of V. Brøndum A/S’s international sales, Germany remains the manufacturer’s number one priority to this day. When asked about the company’s short-to-mid term plans, Per Brøndum – Vagn’s son who has been steering it since 2001 - said that it would remain committed to the European market. Apart from Germany, the company’s business has been steadily growing in France, Switzerland and Norway. The domestic market, too, gives plenty of reason to be optimistic. After nearly 10 years of depression, Denmark’s construction industry has rebounded and considered to be booming. Nevertheless, V. Brøndum A/S remains export-oriented, with overseas sales accounting for 60% of turnover. As far as its marketing strategy is concerned, V. Brøndum A/S still attaches a great deal of importance to trade shows. Given its focus on Germany, the company is a fixture at Bauma and BeBoSa, as well as EPF in Feuchtwangen, a local exhibition popular with manufacturers of surface preparation machinery. As important as Europe is for V. Brøndum A/S, it is testing other markets. Earlier this year the company made it to Las Vegas where its dust control equipment was on display for the very first time at the World of Concrete show.